The latest report from the Federal Reserve Board of Governors provides insight into how card fraud trends are impacting issuers, specifically related to debit and prepaid card fraud losses. The latest report, issued March 21, compiled the latest available data on interchange fee revenue and issuer fraud losses as it relates to debit transactions to provide FIs with an overall outlook into how fraud patterns are shifting and how EMV chip card adoption is impacting counterfeit card fraud. In general, the report concluded that fraud losses as a share of transaction value jumped almost a basis point in two years. According to the report's summary: "Across all debit and general-use prepaid card transactions for covered issuers, fraud losses to all parties as a share of the transaction value were 11.2 basis points, or $11.20 per $10,000 in transaction value, up from 10.3 basis points in 2015." Single-message debit used typically used in PIN-debit transactions, while signature debit as well as credit cards have used the dual-message format. Dual-message refers to transactions in which the clearing and settlement message comes after the authorization. With the adoption of EMV shifting the fraud liability, merchants absorbed 53 percent of losses from fraudulent transactions at covered issuers in 2017. That was up from 39 percent in 2015. Issuers absorbed 42 percent in the same time period ‚ down from 58 percent in 2015. Specifically as it relates to EMV, the report indicated the impact EMP is having on counterfeit card fraud. "The widespread deployment of EMV chip cards has the potential to decrease the incidence of counterfeit card fraud. The overall effect on fraud, in both the short and long term, will depend on how fraud patterns and fraud mitigation methods change as counterfeit card fraud becomes more difficult. "In 2017, the value of chip-based card payments comprised more than half of the value of all in-person general-purpose card payments for the first time, according to the Federal Reserve Payments Study." 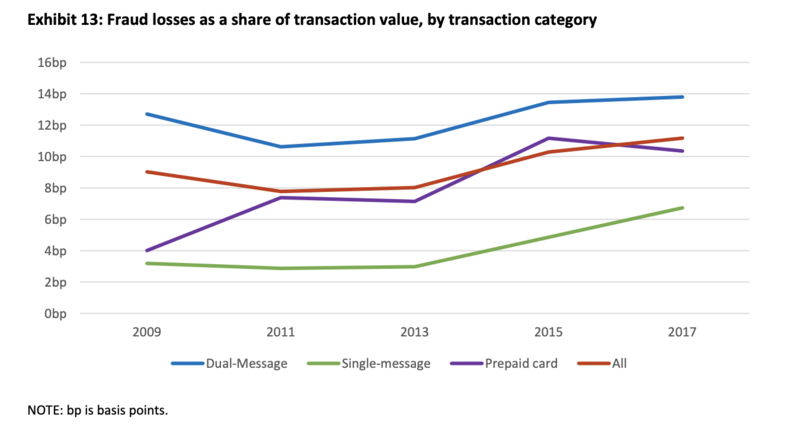 The Fed's report also provided data on fraud losses for both dual-message and single-message debit transactions, which concluded that fraud losses decreased slightly for prepaid card transactions. 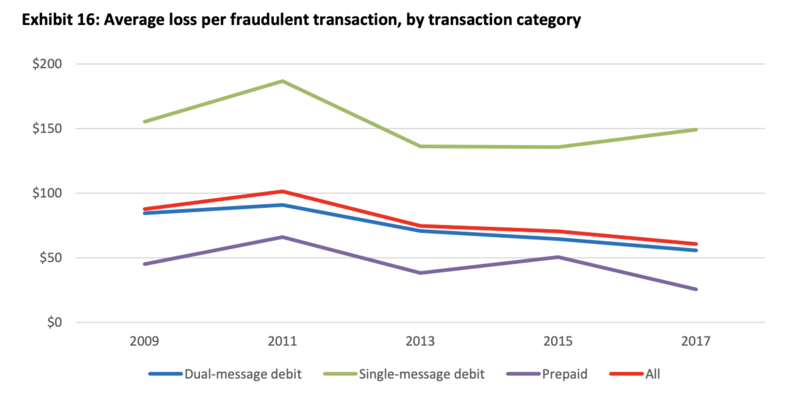 Fraud losses in the dual-message debit category were the highest. 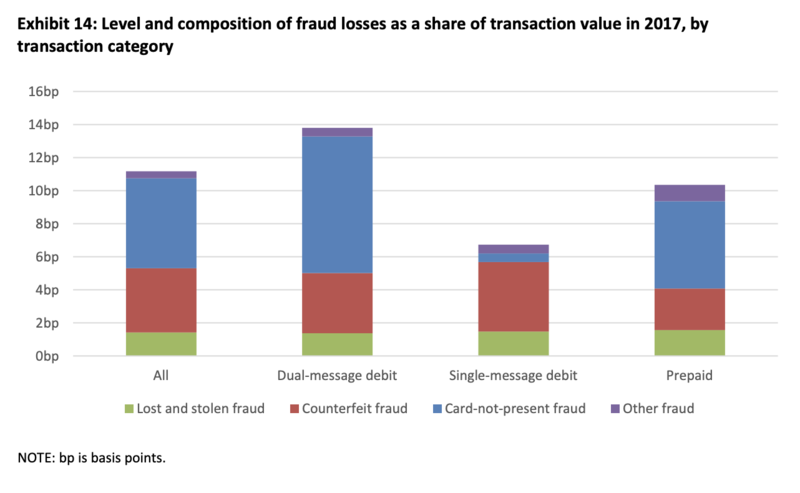 The report also breaks down data by fraud type as a share of transaction value. That report concluded that "overall fraud incidence rose from 5.6 basis points in 2015 to 7.2 basis points in 2017. 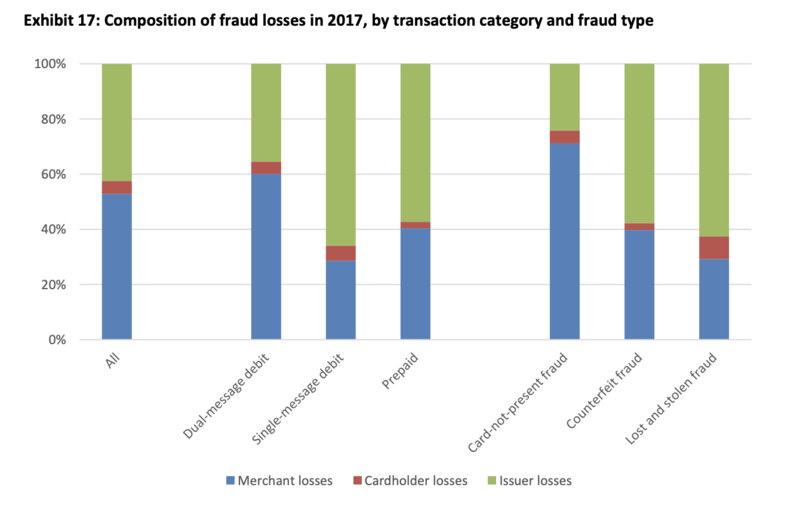 Fraud incidence increased substantially from 2015 to 2017 for each transaction category, most notably for prepaid transactions." The data also showed that the average loss per fraudulent transaction decreased from 2015 to 2017 for all transactions combined and for dual-message debit card transactions. 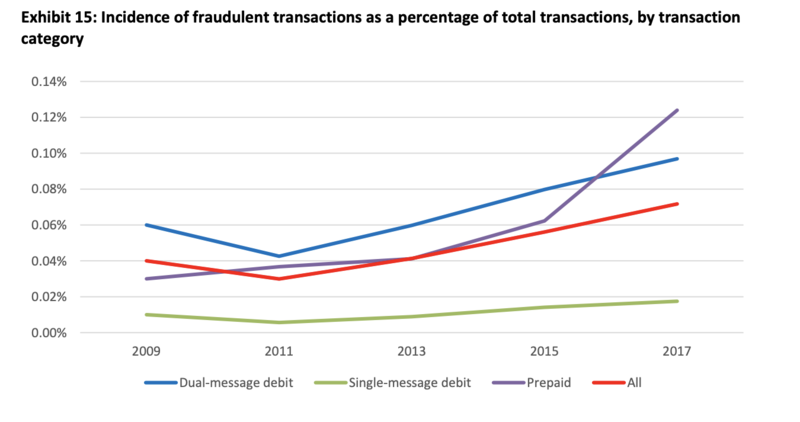 The average loss per fraudulent transaction for single-message debit card transactions increased slightly in 2017. The report also showed how issuer losses vary greatly across the various transaction categories as it relates to the various types of fraud incidents. REPORT NOTES: The fraud data presented in this section are from the DCI survey and, therefore, only apply to issuers covered by the interchange fee standard.21 Because these issuers constitute a particular segment of the total population of debit card issuers, their fraud experience may not be representative of debit card issuers as a whole. As a result, estimates of aggregate fraud that might be derived from these data could differ from those based on information that reflects a broader set of issuers.